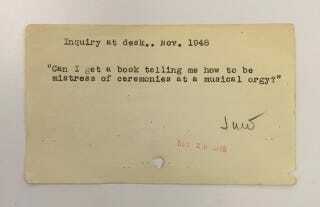 Before we had Google for all of our embarrassing questions, Pinterest for craft inspiration, and Craigslist for all of the odds and ends of life, more people relied on public librarians to field all manner of questions. And the New York Public Library still has records of some pretty odd ones. We found an old recipe box while cleaning out a desk, and it was labeled "Interesting Reference Questions," the contents of which ranged from total stumpers to funny mispronunciations. People came to the library for reference, but also for info on buying and selling, looking for inspiration, crafty project ideas, and even to find photos. In a world pre-Google, librarians weren't just Wikipedia, they were people's Craiglist, Pinterest, Etsy, and Instagram all rolled into one. Mental Floss got a peek at some of the questions, which reflect the wide range of questions, from offbeat etiquette puzzles to animal emergencies. You can see a few below, but check out the rest at Mental Floss. All photos are from the New York Public Library.